There is this flow in our home, maybe in yours too, when we walk in the door coats and shoes come off in the mud room and everything else gets dropped on the edge of the kitchen counter just inside the back door. And there it sits. We rifle through the mail, take care of necessary items but a few days later there is still a pile. 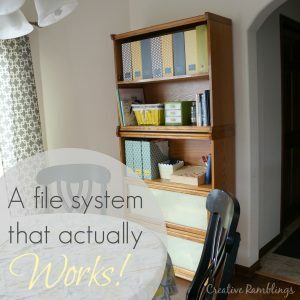 Last week I shared my file system that is actually working! I used pretty magazine files to sort papers and for the last couple of weeks our counter pile has been much smaller. The next step in organizing the paper was finding a place for the mail and important items that needed action. We were visiting my parents this summer and my Mom offered me this chalkboard that has been around since I was a kid. As it turned out it was my mom’s when she was a kid too. My Grandpa made it years ago. I distinctly remember putting the Allstate sticker on this board when I was little. This board was going to get us organized! It just needed to be cleaned up and updated. I started by hosing and scrubbing it down. The original paint was old, thick and glossy. I opted not to sand it and instead used my favorite primer as a base. 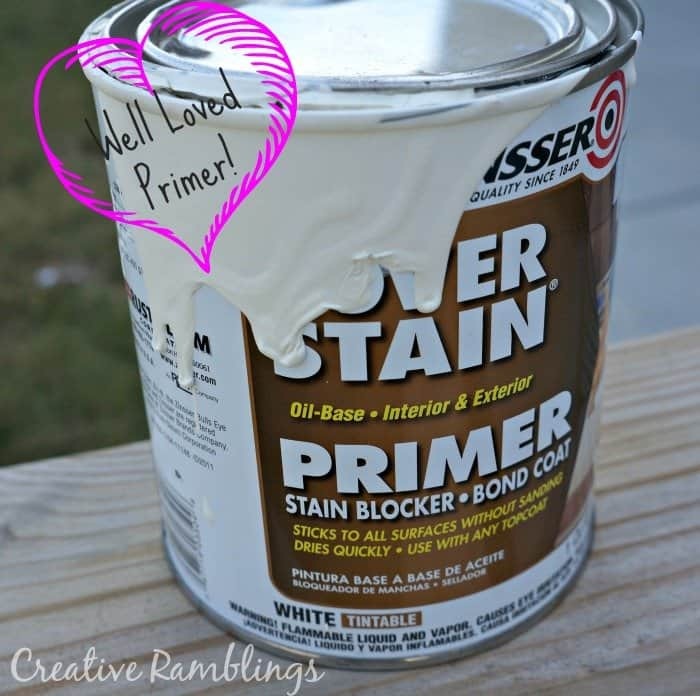 This primer will cover just about anything and allow paint to go on nice and smooth. I’ve used it on dark old furniture before painting it bright white. I’ve also used it on laminate furniture to get a good base for paint to stick too. So may uses, it’s always on my paint shelf. I used some leftover paint from my dining room for the frame. I have a couple shades of gray in my home, all from Sherwin Williams. Our builder painted the rooms and for the life of me I cannot find the name of the paint. Either way, I love it and it coördinates great with my kitchen. I chose to leave the chalkboard part alone, it has a few blemishes and I really like the character. Some of it I added when I was little and some is from my Mom and her siblings. I hung it using Monkey Hooks, it’s pretty heavy and I have been impressed with how well these hooks hold. They push right into dry wall and hold up to 20 lbs. 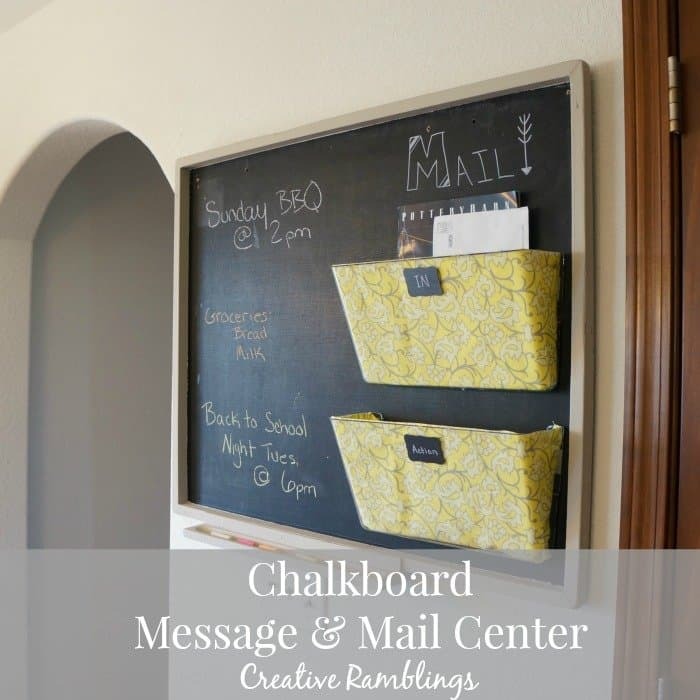 So I had the message board part down, now I needed to add the mail sorting part. I bought some clear wall files on Amazon. Plain but functional. I had originally pictured rustic galvanized wall files but couldn’t bring myself to pay for them. So I opted to put my own spin on some basic pieces. I lined these with a yellow and gray fabric using hot glue. The glue dries clear and dresses up my basic clear holders nicely. I stuck these to the board using strong double-sided tape and labeled them “In” and “Action”. Mail comes in and goes into the top folder. When I have a chance to go through it any items that need action go to the lower file and everything else gets filed away in the bookcase. This system is working so well. I love having a central place for notes and finally having a relatively clean counter top. Tell me, how do you sort your mail? Thank you, I’ll definitely check out your party. 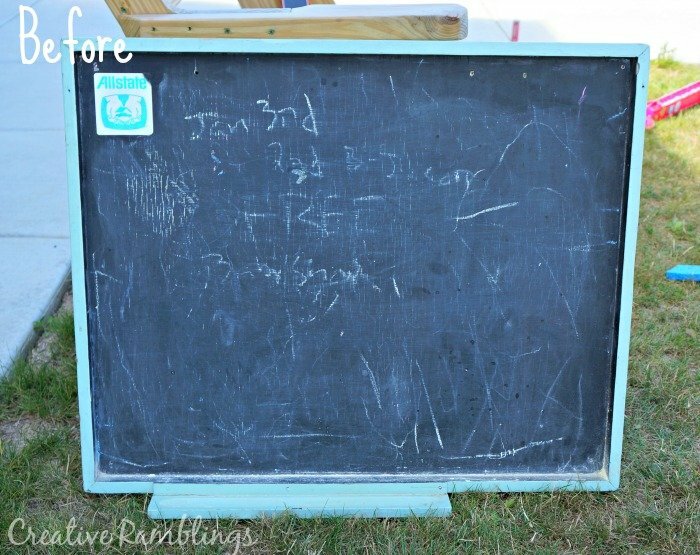 I love the fact that the chalkboard belonged to your mom, passed along to you and that your grandfather made it. Lots of precious memories, I’m sure! I have a side table in the entryway with a bowl for keys and a basket with dividers for mail. I have to say that I like your set up much better. Pinning! Thank you so much Alli, it is a very special piece for me. 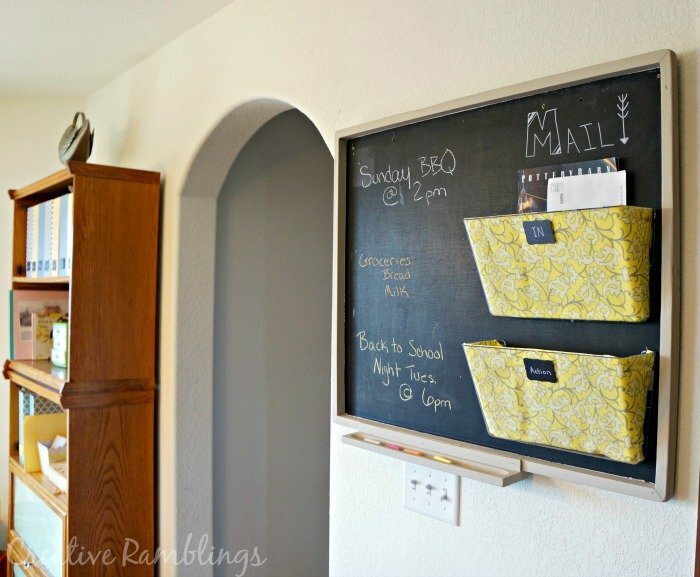 Great Idea…wish I had the room in my kitchen for this…so perfect! Great job refurbishing and coming up with such a nice command center! Love this project. I need this at my house! Oh you are too kind! I’m a day late but linking up now. Thanks Michelle.